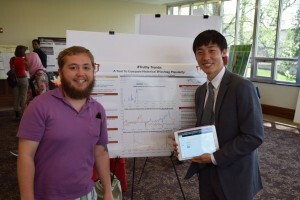 On Tuesday, April 19, IU School of Informatics and Computing hosted its Spring Research Symposium, where NaN was represented by two undergraduate research projects mentored by PhD candidate Clayton A Davis. Keychul Chung received 2nd prize honors for his work on a browser-based tool to compare historical trends of Twitter hashtag use. Kibeom Alex Hong presented a web-based tool to visualize geospatial trends in Twitter hashtag distribution over time. 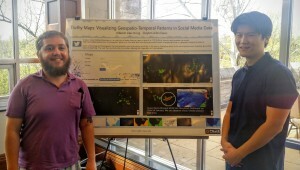 Both projects will be available as part of the Social Media Observatory tools to be released in early May.